White cats are truly beautiful creatures. Is there a cuter animal than a white kitten? My family used to have a white cat when I was little. He had one blue eye and one green eye. His name was Capullo, which means flower bud and cocoon in Spanish. And, indeed, when he as a little kitten he did look like a white flower bud. He was the pride and joy of my grandparents. Ever since, I’ve had a soft spot for white kittens, even though I love all types of cats. Do you have a story about a white feline you want to tell us about? Submit it here. You can even include a picture of your cat or kitten. And here you can read stories shared by our visitors. Have you ever wondered if there are any specific white cat breeds? I asked myself that question the other day and decided to do some research. I learned that there are no white breeds of cats per se, but many cat breeds do accept solid white in their breed standards. Indeed, one popular white feline is the Persian cat (which also comes in several other colors and patterns). Even though they look like puff balls with feet, they’re one of the most gorgeous breeds of cats. --Cats with white fur are often born with "odd eyes". However, not all white felines have bi-color eyes (our family cat had odd eyes, meaning that he had each eye of a different color). --White felines who have odd eyes usually have one blue eye and one green or yellow eye. --A lot of white kitties have both eyes of the same color. Some have blue eyes and others have green or yellow eyes. Some white kittens are born deaf. Some people believe that white kittens with blue eyes don’t hear whereas white felines with yellow eyes do hear. Studies show that, in fact, white felines with blue eyes have a higher prevalence of deafness than solid white felines with green or yellow eyes. However, several breeders have indicated that deafness does not occur in all blue-eyed white felines. Some of them say that they have bred white kitties with blue eyes who can hear perfectly. Others have reported that some white felines with green or yellow eyes are born deaf. 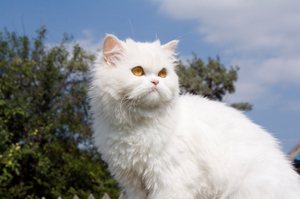 Interestingly, odd-eyed white felines might be deaf in just one ear. Usually, the deaf ear is on the same side as the blue eye. Of course, there are exceptions to the rule. Some breeders have said that they know of white kittens with bi-colored eyes who can hear on both ears. According to some studies, white felines of mixed breed have a higher incidence of deafness than their purebred counterparts. White cats come in both short hair and long hair versions. At least one of the parents of a solid white cat must be solid white. In other words, two non-white felines cannot produce a cat of white fur. 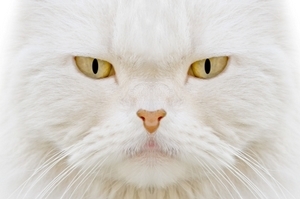 White felines breed both a white color and a masked color (which is unseen to the eye). Many white kittens are born with a color spot on their head. As the cat grows older this patch of color disappears. It is believed that this spot reveals the masked color. -- According to the Guiness World Records, Snowbie – a white kitty - is (as established in 1997) the world’s longest cat. This very long kitty measured 103 centimeters (40.8 inches) from the tip of his nose to the tip of his tail. And, he measured 33 centimeters (12 inches) in height. Reportedly, Snowbie was not only long, but fat also. He weighed 44 kg at the time the record was set. --Duchess and kitten Marie (Duchess' daughter), from The Aristocats, a classic Disney film. --Coco, is a white Persian cat who appears in Disney's Jungle 2 Jungle, a 1997 film starring Tim Allen and Martin Short. -- Kimba the White Lion was the protagonist of a popular Japanese anime series from the 1960s. The original name of the series was Jungle Emperor. The series was based on Osamu Tezuka’s manga of the same title. I used to watch this cartoon when I was a child. 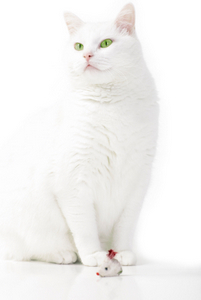 If you have just adopted a white feline and are looking for a name, visit our page devoted to names for white felines. From the obvious (Milk, Snow) to the unique (Opera, Quartz) you will find lots of name ideas for your white little lion. Do you have a great story about your white kitty? Share it! "My Baby" - Soft long haired white -blue eyed...What breed is he? The most BEUTIFUL cat in the world !!!! Big lover boy.VERY laid back. Bionka is about 2 years.She is a white angora..She just had her second litter.They are just over a month. Get me out of prison! My White Cat is a Star, Baby! i just picked up 2 white kittens from the local pound set to be euthanized within hours . Hopefully i can find loving homes for them they are so cute! He tops the scales at about 30 lbs.